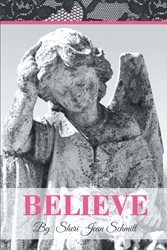 “Believe” from Christian Faith Publishing author Sheri Jean Schmitt offers inspirational words and positive thinking. For those struggling to overcome life’s roadblocks, “Believe” offers words of encouragement. Published by Christian Faith Publishing, Sheri Jean Schmitt’s new book inspires positive thinking. From the author of “Adventures with Peanut,” “Activities with Peanut,” and “Words of Positive Thinking When You Need a Pick-Me-Up” comes “Believe.” Like her previous publications, “Believe” promotes learning and positive thinking by offering words that inspire. As author Sheri Jean Schmitt struggled through the ups and downs of life, the words found within the pages of “Believe” helped her through it. View a synopsis of “Believe” on YouTube. Consumers can purchase “Believe” at traditional brick & mortar bookstores, or online at Amazon.com, Apple iTunes store, Kobo or Barnes and Noble. For additional information or inquiries about “Believe”, contact the Christian Faith Publishing media department at 866-554-0919.